When a crucial lift station in the City of Ottawa flooded for the second time, the city turned to Metropolitan to upgrade the antiquated lift station built in 1955. The station was still able to run after the flood because of the submersible pumps, but because the equipment was starting to deteriorate it was perfect timing for an upgrade. The triplex lift station upgrade included dry pit submersible pumps with brand new Metropolitan controls. The station, prone to flooding along the Illinois River, was upgraded with new controls designed above the flood level to reduce the occurrence of flooded equipment. 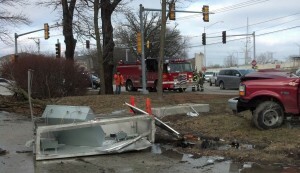 A seven year old sanitary lift station in the City of Des Plaines, Ill., was rendered inoperable after a vehicle lost control. 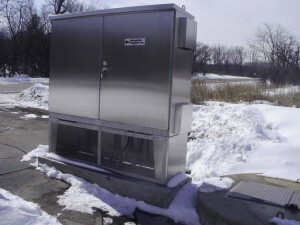 When a car accident damaged a sanitary lift station in the City of Des Plaines, Ill., Metropolitan Industries was called upon to help prevent the approximately 200 condominium and small home resident units from flooding. The vehicle lost control, traveled over a curb and collided with the sanitary sewage lift station equipment causing considerable damage to the lift station and rendering it inoperable. The seven-year-old lift station control panel was in need of extensive repairs. Public works staff immediately responded to the site to assess the damage. The entire control enclosure, associated control panel and power feed from ComEd were all damaged beyond repair. Once the vehicle was removed, staff set up temporary pumping for the lift station. Due to the complexity of the lift station, public works contacted Metropolitan Industries to obtain a replacement control panel. Metropolitan answered the call to restore proper operation of the lift station. The typical lead time for complete replacement is 10 weeks. Since the lift station would be out of service for an extended period of time, Metropolitan was able to install a temporary control system while the new one was manufactured. The temporary panel that was installed saved considerable amount of time and labor, automatically pumping down the water at the sanitary station which would have otherwise had to be done manually every 3 hours. Within weeks, a new customized sanitary lift station control panel was installed with updates to its SCADA system. It was imperative that this pumping system started pumping again before residents returned home from work and used more water. Temporary pumps were set up to run the next day. It was important that the temporary panel was installed because the manual pump could fail at any time without an alarm system to notify personnel. The city was caught completely off guard with this accident. An upgrade usually occurs when a lift station is antiquated and no longer operates properly. The city benefited from the install of a new customized panel with updates to its SCADA systems and new level control system. In the end it was a very smooth transition. Over 6 inches of overnight rainfall submerged the sanitary lift station that services a Lake Zurich neighborhood. 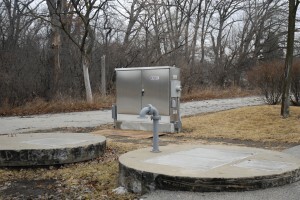 When over six inches of rain from a powerful overnight storm caused a control panel to fail, the Village of Lake Zurich, Ill., called on Metropolitan Industries to assist in the repair of a sanitary lift station in a Lake Zurich neighborhood that was damaged by the flood. The original submersible duplex sanitary lift station and controls manufactured by Metropolitan in 1986, serves an entire subdivision of 187 homes. When heavy rains overwhelmed the village’s drainage system, water backed up, causing levels to rise high enough to damage the panel, which was submerged under water. Storm water rapidly overwhelmed the detention pond and flooded the lift station, the traffic box (control panel), ComEd’s transformers and several homes nearby. 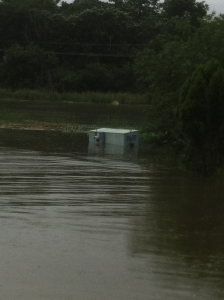 The traffic box was submerged by over 4 feet of water, which caused the control panel to fail, leaving the entire subdivision without sanitary sewer service. After the water had receded, one pump was still operational, but it was uncertain for how long the pump would continue to run. Even with one pump running, it was not enough to prevent basements of some residential homes in the neighborhood from flooding. As a result, some residents lost sewer service for one day. Lift stations elevate wastewater and runoff through a system of pipes and pumps, sending it to higher level toward a treatment facility. When one part of the lift station’s system stops working, there is a risk of sewage backup. After the flooding had receded, the village revived the control panel that evening but had obvious concerns about the reliability of the control panel as corrosion had already become visible on many of the components. Metropolitan was able to provide a quick solution to the village by installing a temporary control panel that was rented from Metropolitan to keep the pumps operating while a replacement control panel was manufactured. The replacement control panel was designed to sit higher to help prevent the new panel becoming submerged. The lift station is located in a lower area next to a detention pond. Keeping the flooding issue in mind, the new control panel was designed to sit higher to help prevent the new panel becoming submerged in case another flood event were to occur. The replacement traffic box with new control panel also has Metropolitan’s new LMS II, Level Management System installed allowing the village to seamlessly alter pump options, transducer options and more, while providing access to basic SCADA features. Winter temperatures are not to be ignored, especially this past winter, which brought two polar vortexes to the Midwest causing many heating systems to fail. Among those affected was the home of the men’s and women’s swim team at Lewis University in Romeoville, Ill. The existing pool heater failed at the same time the university’s swim season was starting. When the original pool heating manufacturer said it would take 3-4 weeks to replace, the engineering firm, Grumman/Butkus Associates of Evanston, Ill., called on Metropolitan in an effort to fix the problem quickly. It was imperative that the heater be replaced quickly due to the NCAA rules requiring the pool water be at a certain temperature in order for the athletes to be eligible to compete. As a result, the university purchased a brand new Laars Pennant CP 1.2M btu/hr. with a Cupro-Nickel Heat exchanger pump mounted pool heater. The high-performance pool heating boilers produce warm water at efficiency levels of 85% or more. In addition to the Lewis University men’s and women’s swim programs, the pool is also open to members of the Student Recreation and Fitness Center. Within one week the pool was reopened. 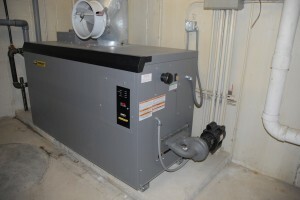 Metropolitan was able to order parts immediately and received the water heater within five days and the contractor installed the heater next day. Laars Heating Systems offers 72 hour expedite shipping on all Laars products. As one of the only companies offering that service, Metropolitan, a Laars sales representative, provided the exact size Laars pool heater required by the university. The biggest challenge was identifying the cause of the pool heater failure. After identifying the problem of the first failure, modifications were made to reduce potential failure of this heater, which was modifying the way it was installed. Not many companies look at the “whole picture”. Lewis University was desperate to find a replacement heater fast and even considered renting temporary pool heaters to save the swim season, but they were unable to locate companies that rented pool heaters that large. Grumman/Butkus Associates main goal was to help save the university’s swim season. A Laars Pennant CP 1.2M btu/hr pump mounted pool heater was installed at the Student Recreation and Fitness Center at Lewis University in Romeoville, Ill.